How many people would be interested? When I threw up a VERY spur of the moment Milwaukee-athon idea, there was no interest beyond Jim, so I wonder how many people have a desire to schlep to Milwaukee. I would note, though, that from the North end of Chicagoland, the drive is about the same as heading into downtown Chicago. Last edited by Vital Information on October 21st, 2005, 3:06 pm, edited 1 time in total. I am game for another dinner here, and Mrs. JiLS is up for it, too. We are fine with the 5th or the weekend after Thanksgiving, or whatever. Rob, I think the reason they piled on with the "encouragements" to have a few "extras" during our August meal was that they had two men with three lovely ladies in their company, and to top it off, both men were lawyers; it's hard to blame them, really. This time, we'll have a different group balance that might eliminate that motivation, or at least throw them off a little bit. Besides, the food is pretty good, and I'd like to hear Andy Warhol playing the guitar once again. Vital Information wrote: How many people would be interested? When I threw up a VERY spur of the moment Milwaukee-athon idea, there was no interest beyond Jim, so I wonder how many people have a desire to schlep to Milwaukee. I would note, though, that from the North end of Chicagoland, the drive is about the same as heading into downtown Chicago. RheS and I would be pleased to dine at OTSGH again on Nov. 5. OK, the requisite baby sitting arrangements have been made. 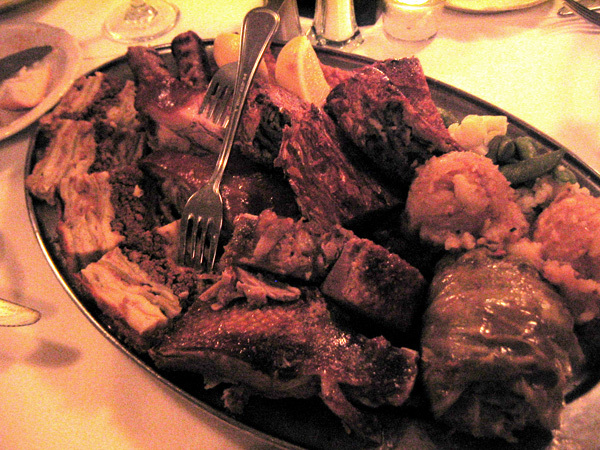 So, it's off to Milwaukee on November 5 for Serbian food. 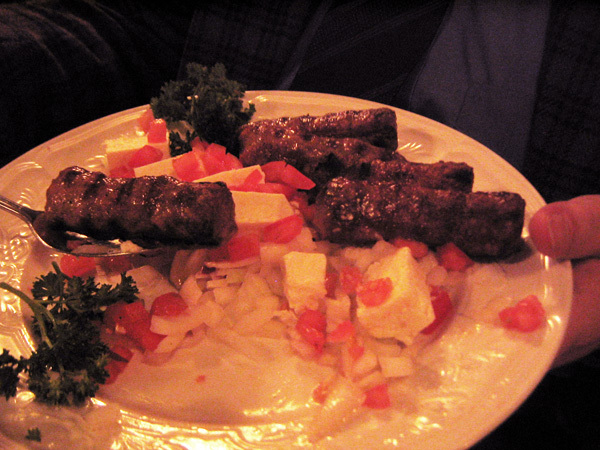 Remember that they have two kinds of cevapcici! FWIW, Susan and I will also be going to the newly-opened Milwakee Public Market Sunday morning ... normally we'd hit the Evanston Farmers Market here on Saturday morning, but I think we'll try picking up a different array of stuff Sunday morning in Milwaukee. I want to note, that even with the awesome demand to eat in Milwaukee, I think a few stalwarts can be accomodated. We have a reservation for 8 at 7 PM (not 7 people at 8 PM! ), but no set menu. Given that this place is a BIG restaurant, I think they can squeeze a few people in if you have a sudden urge to race to Milwaukee. And as been noted above, why stop with burek and such when there's custard, cheese spread and brats also to be had. I also liked the comment (paraphrasing) "The problem with meals like this is, a week later you're hungry again." And I have to say, the Vranac (red from Montenegro) wine started to grow on me after a while. The Public Market was also fascinating, and again begs the question why it couldn't be done here. We wanted to come back with Wisconsin Cheese from the market, but it seemed like a better idea to stop at the Mars Cheese Castle, where we got a 9 year old cheddar. We sampled the cheese curds at the Milwaukee Public Market and (horrors!) they didn't squeak. Last edited by nr706 on November 7th, 2005, 10:59 am, edited 1 time in total. The image in my head of what Old Town Serbian would be like was... really, really Serbian. I mean, long wooden tables, guys in cassocks, oxen parked outside, like that. Something like Szalas. The reality? 70s, maybe even 60s. And I don't mean 70s/60s like Flourchild's, I mean-- stucco walls and a guitar-upright bass-accordion combo hitting every classic of the easy listening repertoire-- That's Amore, Besame Mucho, Ma Vie en Rose, Don't Get Around Much Any More, Never On Sunday, The Godfather theme. How they missed Lara's Theme and The Windmills of Your Mind, I'll never know. In case this paragraph comes off like criticism, I loved that part of the experience. Restaurants are, with movies, the only true time machines. Crepes with apricot jam inside them. The extra helpings of whipped cream seemed to have their fans, certainly. Anyway, an adventure. A trip backwards in time, to the kind of place that would have died off in Chicago by now (and actually did, I suppose, e.g Miomir's or Little Bucarest). A good time with an interesting bunch of LTHers. Prost! I sort of had the feeling the server found me a bit of a needle in her side; which was not my intention. My first prick was when I double checked they had served us Kaijmak cheese, which is a speciality of Dalmacija. It wasn't true Kaijmak cheese in my opinion, sort of an approximation, though I probably ate most from my end of the table. My next prick came after reading through the menu, I inquired if they ever served Scampi Buzara. The picture below very accurately depicts how it was served and consumed. Oh how I remember my first and dream of next experience! While this is a very typical Croatian dish, she insisted it was Italian. Given how the border there has shifted back and forth, we are probably both right. She offered to have the kitchen make it special for me using shrimps. Something I might have been tempted to do all by my lonesome, but nothing I would commit to under these circumstances. I have made it at home substituting mussels for langoustines. Though I might just try it with the frozen langoustines and advise if it is close to the original. My last needle prick was when we were ordering dessert of the pancakes. These are very often served with rosehip jam spread inside, which is my preferred version. Another popular alternative is ground walnuts and sugar inside. They didn't precisely offer either version. Instead it was either apricot or strawberry jam inside with ground walnuts on top. Our waitress was from Montenegro, which is not Serbia. Yes, it was a brilliant evening with lots of bread and circuses. Thanks Rob for inspiring this! The service, with the food all divided on big platters, certainly made things easier to share. I don't think they're used to having eight people want to share one of each entree. They tried pretty hard to accommodate us in some odd (to them) ways of ordering. It's a pity, though, that we didn't get to see the burek whole -- it's impressive. The food is much more attractive the way they normally plate it. My take on this place is that they're a mix of rustic Serbian and what used to be called "Continental." Sorry, MikeG, that I didn't emphasize the white-tablecloth nature of the place in my Milwaukee report. I think I'd have enjoyed the veal Wellington. I'd like to go back and see what they do with lamb and duck sometime. Rob, thanks for the excuse to return, and to all for the fine company. Back when I first tried it, in March or so, I came away convinced that it would be the perfect place for an LTH blow-out, especially for, like one of their roast dinners. I noodled on that idea for a long time. Then, JiLS and I went on very short notice. 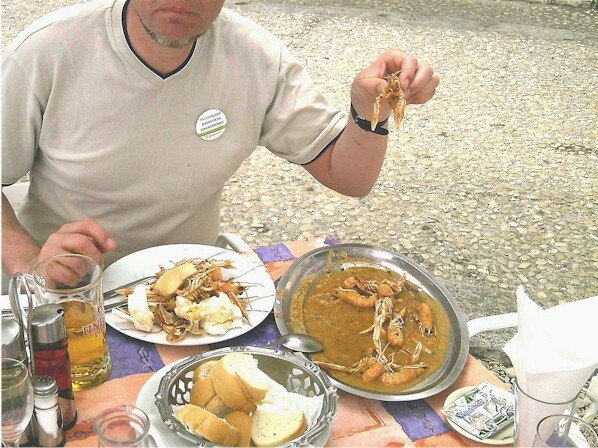 The second meal, was to me, as delicious, but Jim and I had this problem of control. We seemed in constant battle with our waiter for it. When the bill came, we had no idea what we had truly ordered and what we had to pay for. The fact that the bill was higher than expected added to the discomfort. It left me with a slightly negative feeling towards the place. Yet, I still loved it. LAZ's post inspired me to start again on a dinner. Which is where we ended up on Saturday. Both my wife and I knew we could not relinquish such control again to our waitstaff. This time, we would at least know what we ordered. And it mostly worked. The final figure of $37.50 with two bottles of wine and some drinks seemed apt. Between me and the Condiment Queen, someone did not like things as much. It aint me. I loved nearly everything. No one roasts a better red pepper than this place, and as MikeG noted, they can coax something outta an off-season tomato that few others can. I liked the pure excess of the all-brown platter. While the pork and goose were fatty and tough, I still enjoyed their rarely had flavors. They also did very well with the onion-y Serbian mashed potatoes. I liked the mousaka, which my wife thought too cold. She also did not like the crepes, finding them too sweet. But healthy marriages are made on such disagreements. One final note, it has not been mentioned, but our server was actually Count Dracula. OK, a few more notes: As I mentioned that night, one of the great things about Milwaukee places is how stuck in time they are. One time, I was gonna write a piece on the strata of Milwaukee dining, Karl Ratzh as 1890's, Turner Hall at the turn (no pun) of the century; Pandl's as the 1910's, Gilley's as 1920's, Leon's as the 1950's, Real Chili as the 1960's, etc. Well, as noted, Old Town fits the 70's to a tee. I'll save the Milwaukee Market for another post. As some might say, the city hit a home run with this thing. VI wrote: One final note, it has not been mentioned, but our server was actually Count Dracula. The guy who was very present making sure our water glasses were filled reminded me of Lurch from the Adam's Family. Lots of colorful people present and it was not limited to ourselves! I forgot to add, that post Old Town, not that we had not eaten enough, but this was Milwaukee, LAZ, RheS, the Condiment Queen and I visited Kopps. 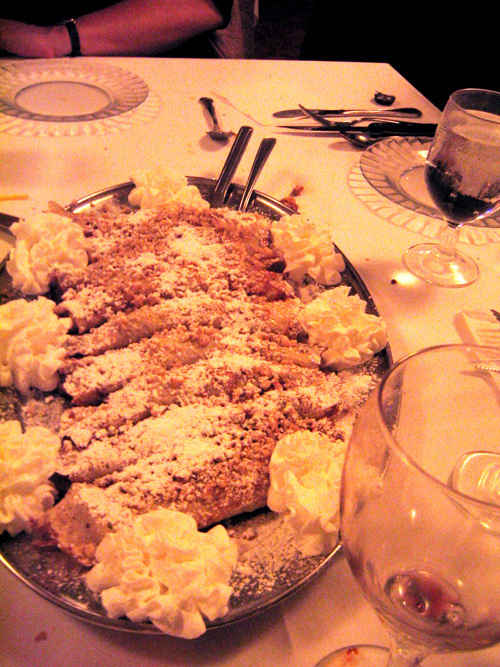 Yes, of all the custards I've tried this year in Wisconson, Kopps was the best. Vital Information wrote: someone did not like things as much. Quick note: I thought the food was especially authentic (although someone forgot to flame his slivovitz). But "authentic" and "appetizing/tasty" by today's standards can be two completely different things. After I came home from dinner at this joint on Saturday night, I figured I'd take a stab at an LTH search to see if anyone else had been to this joint. Who'd of thought? Anyway, we were at Miller Park for a Brewers game in the afternoon. On the way up to the game, we stopped at Wells Brothers for a stellar lunch of salad and pizza. Right around the 8th inning, my wife, as expected, asked me what we were doing for dinner. I whipped out the cellphone and did some snooping. There was a Groupon for OTS. It was on the way home. I figured, why not? As noted upthread, this place is frozen in time. My wife and I were most certainly the youngest people in the dining room. She chose the moussaka (it was huge) and I had the cevapcici. We left happy and stuffed. Kopp's would have to wait for the next trip up to Milwaukee.